Aerial view of Kilauea Volcano summit caldera; the view is to the southwest. 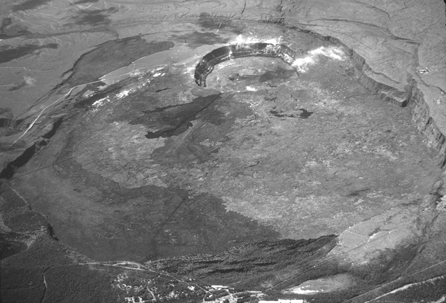 The caldera is 4.5 km by 3 km, and Halemaumau Crater, in the upper center, is 1 km in diameter (January 10, 1985, J.D. Griggs).